Bubba Watson is an anomaly in professional tournament golf. He breaks the mold with his swing and how he navigates the ball around the golf course. As a golf teacher, I am hard pressed to explain why Bubba can do the things he does. As an amateur psychologist (most golf teachers are) figuring out Bubba's psyche and mental state would require volumes. However, how he plays golf is what all of us should aspire to! On the surface, you wouldn't think that Bubba would rank high in consistency of greens in regulation give his great length and ranking 153th in fairways hit, but he ranked first in the 2015 season when going for the green with his approach shot. He was also number one for shots gained from tee to green. Riviera Country Club, the site of the Northern Trust Open in Los Angeles, is known as a ball striker's course. It plays longer than the yardage on the card and requires length and accurate driving. The kikuyu grass on the fairways makes the ball sit up beautifully, but when pitching or chipping, it is like Velcro and very difficult to judge. The greens are mainly poa annua, which technically is a weed, but makes a wonderful putting surface in the mornings until the buds start growing in the afternoon. This makes it a premium to hit the fairways and greens, because you are not going to consistently scramble for pars as Jordan Spieth found out the first day with his 8 over par 79. Nine of the top ten ball strikers in the world were at Riviera to play what the locals call "Hogan's Alley". Bubba won for the second time in three years on a course that needs accuracy, shotmaking, and imagination. Quality players can work their way around a course. 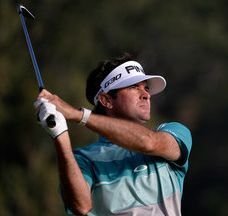 Bubba is proving he can do that and that he deserves to be in the top five in the world. Bubba is unique because he doesn't have a swing coach or thinks about his swing or works on technique on the practice range. He uses the range to limber up his body and create golf shots. He does not think about what his body is doing; only what he wants the ball to do. He has been self-taught his whole life since receiving some instruction from his father at an early age. He visualizes the shot he wants to hit and lets his body create the motion necessary to produce the shot. It has been said that he might be the most brilliantly talented player ever to play the game. To return the club to an exact point consistently with as many moving parts that his swing entails is something that maybe only he can do. My goal as a teacher is to give my student the best swing or sharpest tool possible so he or she can "play" the game to the best of their ability. Once the swing is learned, to a degree of proficiency, you are to use it to "play" golf. That doesn't mean that you can't improve your tool that you use to play golf, but you shouldn't do that when you are playing the game. Bubba trusts his ability to hit his shots in the image that his brain imagines. He doesn't rely on a list of "do this" and "do that's" to produce his golf shots. His goal is to move the ball around the course to shoot as low a number that he can. We can all learn from his approach so that when you have finished your preparation and are over the golf ball ready to make your swing, the only thing that you are thinking is where you want the ball to go in the image that your brain has imaged. When you accomplish that, you will truly free yourself to play your best golf.